Posted on August 6, 2012 by Becki M.
I really can’t believe that its time to start school again! I’ve been in crazy lady mode as I print/laminate/copy/organize/plan everything; this is the first year really managing TWO kids at the same time. Jackson will be doing 3rd grade and London will be starting preschool. Brooklyn will do some stuff here and there as she is interested! There are lots of changes this year! I’ve added in new things and replaced things that weren’t working as well. Our schedule has changed and the amount of seat time is different. I’m really excited to see it work; this is the most organized and in control I’ve ever felt, lol! First things first…my planner. This year I am using the Ultimate Homeschool Planner. I am in LOVE with this thing! I saw it at the conference I attended back in March and couldn’t wait to order it and start using it. It gives plenty of space to plan for multiple children, which I love. I’m basically running it by listing everything that needs to be done for each subject for Jackson, and then checking them off as we complete them throughout the week. London’s is planned out by day (hence why I added Mon-Fri above her section). It also has monthly planning pages and a yearly planning page. We are using Letter of the Week by Erica at Confessions of a Homeschooler. 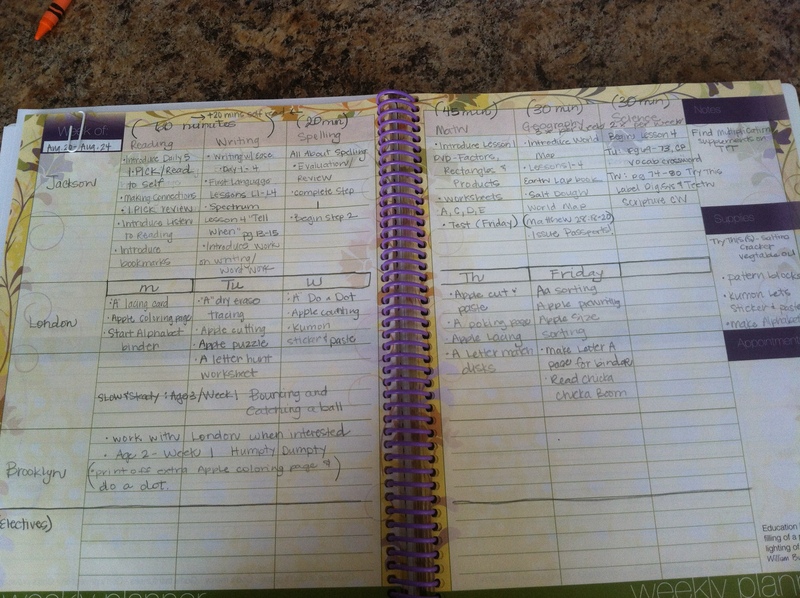 While I actually haven’t used it yet, it was super easy to plan because she actually GIVES you the lesson plans for the week! Woo-hoo! All I have to do is print and laminate what I need for that particular week, write what I choose in my planner, and we are good to go! What’s great about using a curriculum like this is the blogger has posts about every lesson and how she did them…perfect for if you have any questions or would like to see how she intended an assignment to go. I have Letter A all printed, planned and ready to go. My goal is to having everything prepared for the entire year for LOTW so I can just grab it and go instead of spending an hour every week getting everything ready. Doing this is going to make teaching two kids at the same time SO EASY! Basically, I will get Jackson started on Read to Self. I will spend some time teaching him how to pick out a book, what I expect of him while he is reading, etc. Then, he will find a cozy corner and read for 20 minutes. While he is doing that, I work with London. I get her started, working…by the time she is going strong, Jackson is ready for the next station. I’ll spend some time with him in a lesson (from Language Lessons and Writing with Ease), then start him on his next independent task, like Word Work. As the year gets started, I’ll do a whole separate post on The Daily Five so you can see it in action! As for the books he is reading, I’ve chosen Core C readers from Sonlight. I will have to add more throughout the year since he reads through them so fast. We will use Sonlights Core A Read Alouds for our read out loud time. Spelling: All About Spelling, Level 1. Level 1 we will fly through pretty quickly, so I’m sure I’ll be adding Level 2 and 3 throughout the year. Grammar is First Language Lessons, Level 2. We loved Level 1 last year, so we are just continuing on! Writing is sort of the hard one. I’m using Writing with Ease, Level 2 which is great for teaching comprehension, dictation, and narration. What I don’t like is that there aren’t any actual writing assignments. So, I’m supplementing with stuff I find from some of my favorite bloggers on Teachers Pay Teachers. I’ll do mini units throughout the year, and he will have to write everyday as part of Work on Writing in the Daily Five. Out of all my subjects, writing is the one I’m the least confident in. Math is Math U See: Gamma. This is our third year using this curriculum and we love it! This year Jackson is learning multiplication! Science: We are finishing Apologia’s Young Explorers Human Anatomy and Physiology. We started this in April and took a break during the summer. We will finish this before the school year ends, and then I’ll choose the next book, depending on what he is interested in at the time. Geography: We are using Confession of a Homeschooler’s Expedition Earth! Just like her LOTW program, she has is all planned out. London and Jackson will be doing this together, but Jackson will have the country/continent/people group reports. I made their passports this morning…it should be really fun! Electives: I haven’t added these in yet because I need to see how my day runs with our core. I have Artistic Pursuits for Art and am looking into a Latin language study. I probably won’t add these in until October. As our year starts, I will blog about each of the elements in our Core, such as Expedition Earth, LOTW, All about Spelling, and The Daily Five; our daily schedule and how I organize my day; and tips and tricks of the trade. I’m really excited to see it all come together! Posted in Homeschooling and tagged homeschool planner, letter of the week. Bookmark the permalink. It sounds like you are really excited about your curriculum! I will be standing by to see how it all unfolds. I always enjoy hearing about everything you discover and how you implement it all. Good luck! Hurray for another school year! After taking the month of August off, we’ll be starting back up too! Can’t wait to follow along and see how everything works for you.